In 1st loop, 2nd data of array becomes parenthesis data, then being compared with all previous data (3). If there is no data which is bigger than parenthesis data, there is no data that will be shove backward. In 2nd loop, 3rd data of array becomes parenthesis data, then being compared with all previous data (3, 12). There are two data which are bigger than parenthesis data so those data will be shoved one step backward and put parenthesis data at 1st place. In 3rd loop, 4th data of array becomes parenthesis data, then being compared with all previous data (2, 3, 12). This data will be placed at 3rd place. In 4th loop, 5th data of array becomes parenthesis data, then being compared with all previus data (2, 3, 4, 12). Because there is no data that bigger than the parenthesis data so the parenthesis data still be in the 5th place. In 5th loop, 6th data of array becomes parenthesis data, then being compared with all previous data (2, 3, 4, 12, 13). This data will be placed at 4th place. In 1st loop, it will look for smallest value between 1st and 6th element of array. 2 is the smallest value so its place will be switch with 1st element. In 2st loop, it will look for smallest value between 2nd and 6th element of array. 3 is the smallest value so its place will be switch with 2nd element. In 3rd loop, it will look for smallest value between 3rd and 6th element of array. 4 is the smallest value so its place will be switch with 3rd element. In 4th loop, it will look for smallest value between 4th and 6th element of array. 5 is the smallest value so its place will be switch with 4th element. In 5th loop, it will look for smallest value between 5th and 6th element of array. 12 is the smallest value so its place will be switch with 5th element. This method will switch two element continously until sorting has been finished. This method is not efficient but easy to be realized. And so on until 16th loop. Why it is until 16th loop. It has been sorted at 4th loop. Because there are 5 element so there must be 4 exchange process for each term and also must be done 4 times to ensure that all elements has been sorted. 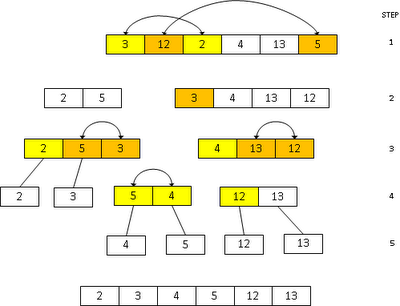 Array will be traced from left and from right. Array is the first element from the left, then it will trace from the right to the left to find smaller value than Array. Array which is smaller than Array will be switched. Array is next element from the left. Array which is smaller will be switched. We have sub-array. There is no switching because Array is smaller than Array. Array is first element from the left of new array, then it will trace from the right. There is no smaller value than Array so there is no switching. When we move Array to left sub-array, we know that there is no smaller value than it at right sub-array. At left sub-array, Array as the first element will be compared with another element from the right to the left. But, we don't get any value, so Array must be the smallest value. Array and Array are switched. First element of right sub-array is Array. After tracing from right to left, there is no smaller value than Array, so it will be move to left sub-array then. We have gotten Array and Array sorted. Array and Array will be switched after being traced. Next, there is no smaller value than Array at right sub-array so there is no switching. From the third step, we know that there is no smaller value than Array in right sub-array, so after it is switched with Array at fourth step, it must be sorted. Array is smallest value and there is no smaller value, so it also must be sorted.